A series of winders that are arranged to have the same width close to the inside of the turn as the adjacent flier treads. Balanced steps give a far more comfortable set of winders that replace a quarter turn stair landing. Normal stair winders are fairly uncomfortable and quite dangerous. Doing it this way is a compromise. By far the best way is to do a quarter turn landing, but in cases where room is tight then this might just do. The way that it is drawn here is just about as wide an arc as possible unless the means of the exercise is to incorporate the curve. I have drawn the curve here that takes up as much space as two ordinary treads, so by using winders like this only one extra rise is gained in the stair. More often than not a shorter radius is used. Note that I have drawn in a couple of dotted arcs on the plan. 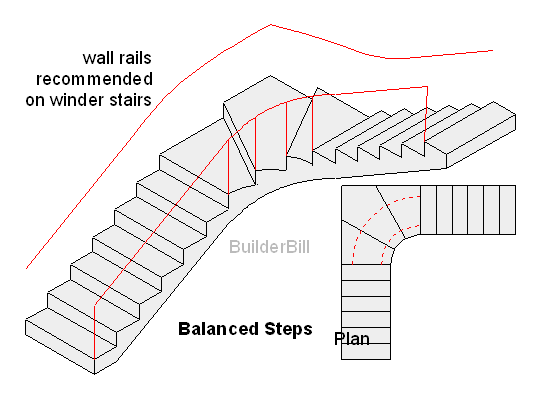 They are used to get the slope relationship value if the stair is wider than 1000 or 39".